Corals won’t fare well in a warmer world. A mere degree or two rise in temperature can cause them to bleach, or turn them white as they expel their symbiotic algae (which produce their food). 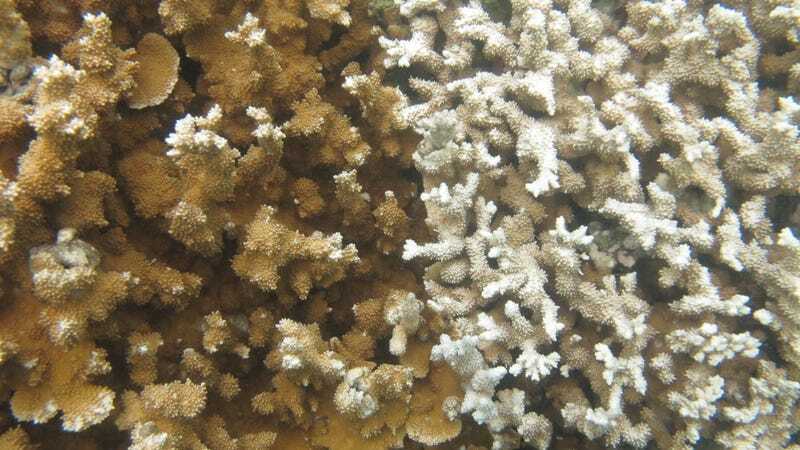 This process may eventually lead to death, but new research shows that corals in Kaneohe Bay, Hawaii, are withstanding these bleaching events longer than they did nearly 50 years ago. The study, published in PeerJ Tuesday, offers some of the first evidence that corals of the same species from the same place can acclimatize and adapt to increased ocean temperatures. A team from the Hawai‘i Institute of Marine Biology at the University of Hawaii conducted the new research in 2017, comparing their results to a similar experiment in 1970. Both investigations involved gathering three coral species near the Moku o Lo‘e Reef in Kaneohe Bay, though an extra species joined the latest study. Butterflyfish are so cool, man. The team monitored a total of 480 coral colonies under different conditions for 31 days. After being collected from the reef, some were placed in shaded experimental tanks outdoors with seawater collected from the site. Others were exposed directly to sunlight. The tanks were equipped with butterflyfish and surgeonfish to keep algae and pests away while scientists measured rates of coral mortality, bleaching, and calcification. This time around, the waters were warmer than they were in 1970. From July to August (when scientists conducted the studies), temperatures were 2.2 degrees Celsius higher in 2017. But this temperature increase didn’t keep the corals from thriving. In fact, corals were surviving at higher rates in these warmer waters, even when the team ramped it up and increased the temperature by another 2.8 degrees Celsius. Back in 1970, only one coral species saw a decent level of survivorship under these thermal tolerance treatments—and that rate was just 40 percent. In the most recent experiment, that number spiked to more than 90 percent. The corals last year also took longer to bleach and longer to see whole-colony mortality. This is all wonderful news! Of course, lots can change in 50 years, so this was no perfect comparison. Back in the ‘70s, Kaneohe Bay was a dump. All the sewage that entered it brought higher nutrient levels, but the water quality in the bay is much better these days. (I’d know because I swam in it.) The team hypothesizes pollution could’ve contributed to some of the high levels of bleaching and mortality the corals saw in the 1970s, but such impacts usually happen at exposure to much higher levels of nutrients, Bahr said. So there’s still uncertainty around how higher nutrient levels impacted the coral in the ‘70s. Are lower pollution levels helping corals survive today? Do genetics have anything to do with it? These are questions still left to answer, but these findings set a foundation for coral enthusiasts elsewhere investigate how their colonies might adapt. Keisha Bahr surveying some coral like a badass. “It is possible that similar levels of acclimatization and/or adaption has occurred on other reefs,” Bahr said. As encouraging as this all is, the paper is sure to note that waters are warming at a rate many corals might not be able to adapt to. “We are uncertain if corals can change fast enough to keep up with these increasing temperatures,” said Bahr. If we keep emitting greenhouse gases and warming the atmosphere and, subsequently, the seawater, coral will die. That’s why a separate team at the Hawai‘i Institute of Marine Biology is trying to create super corals. If corals can’t adapt to the climate on their own, maybe humans can help them get there.